Fennel fronds--a sure sign of spring. Tramping through an overgrown field, I catch the first whiff of spring—the unmistakable scent of wild fennel. The first sprouts of fennel, crushed underfoot, give off a distinctive sweet, springy-green, anise smell. 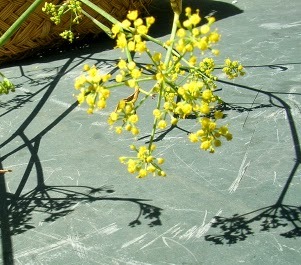 Wild fennel grows on dry slopes where I live in southern Spain. After spring rains, the plant sends up the first green fronds that grow to tall, rangy stems by the end of summer. 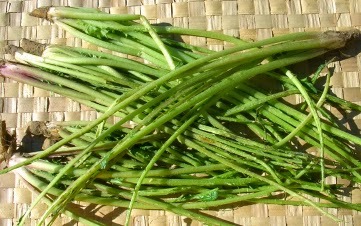 Late in the year, the stalks bear yellow flowers (source of fennel pollen) and bracts of immature seeds. The seeds eventually turn brown and fall away and the plant dies back in the winter. 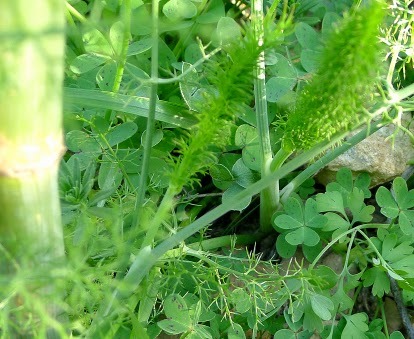 Tender fennel shoots for spring soup. 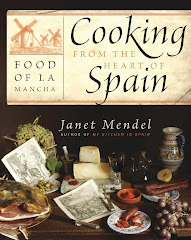 In Andalusia (southern Spain), country folk gather the first feathery shoots of fennel to cook in a potaje, a stew with chickpeas or beans, wheat berries and sausage. Snippets of the fronds are also sprinkled on spring vegetables such as fava beans, peas and artichokes. 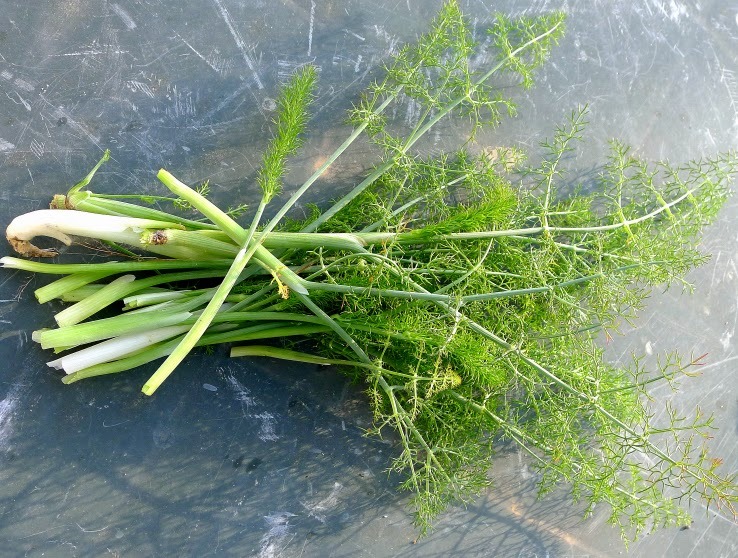 To use wild fennel, choose only young, tender stems. They should be pliable and easily sliced with a knife. Strip off the feathery leaves, saving a few for garnish. 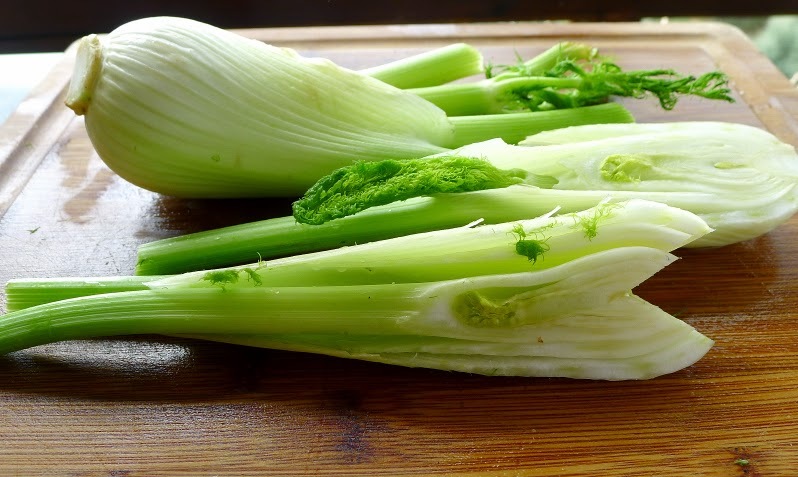 If wild fennel is not an option, cultivated fennel bulbs, which you’ll find at the green grocer’s, can be substituted. Fennel, whether wild or store-bought, loses its pungency with slow cooking, adding a subtle background flavor to the soup. A garnish of chopped fennel leaves, added just before serving, returns the sweet spring aroma to the dish. Two versions of Fennel Soup, bottom, with sausage; top one is vegan. 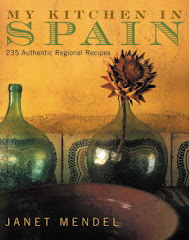 The first version of wild fennel soup comes from the upland regions of Granada and Almería, where springtime can be blustery and cold. 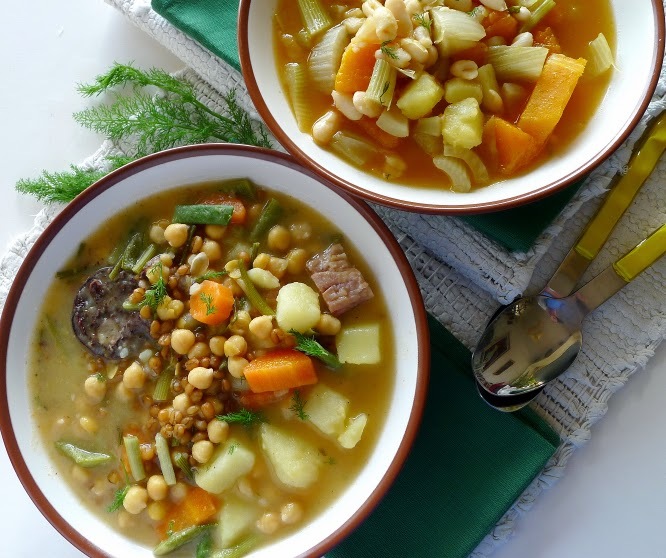 The robust soup is made with pork ribs, pig tail, fat and sausage (my interpretation is slightly modified) plus chickpeas or beans, sometimes both, and wheat kernels. 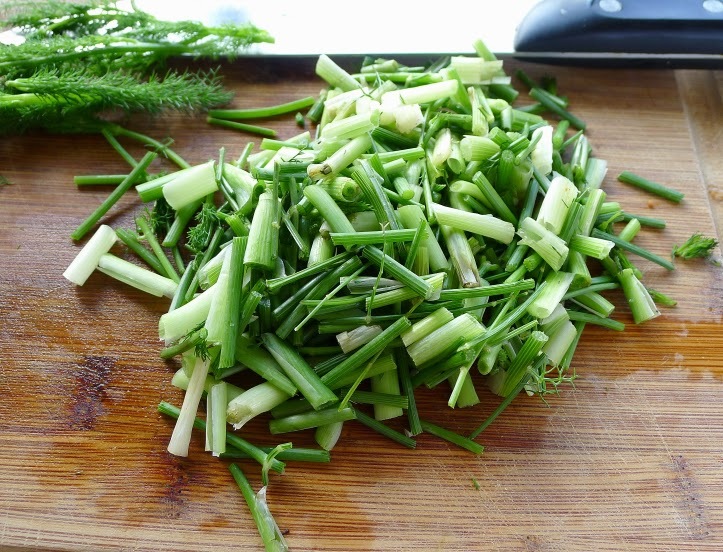 Besides wild fennel, it might include other foraged greens, such as cardillo (also known as tagarninas), a kind of thistle, or wild asparagus. 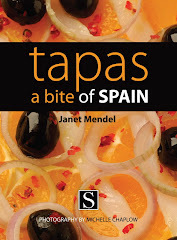 If morcilla sausage is not available, you could use any pork sausage in the soup. Wheat berries are delightfully chewy. If not available, try brown rice in the soup, but don’t add it until the last 40 minutes of cooking. I used cooked chickpeas. I soak and cook chickpeas in large batches, then keep them in the freezer to use as needed—quickie hummus, salads, soups. If desired, you can start with uncooked chickpeas. Soak 1 ½ cups chickpeas 12 hours. Drain and place them in the soup pot at the very beginning of cooking. They need about 90 minutes to become tender. 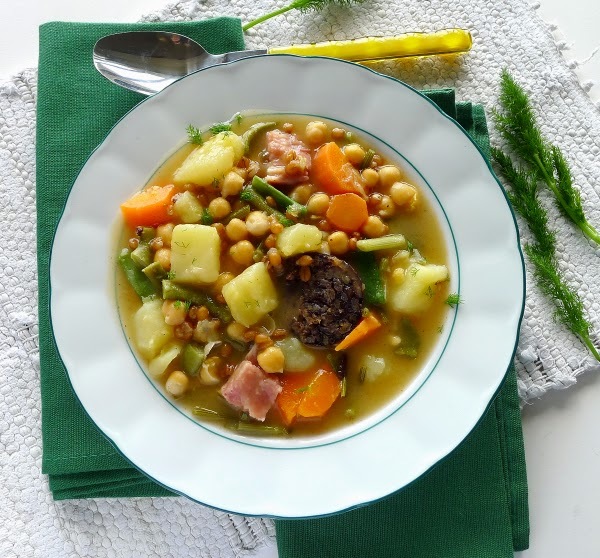 Fennel soup with chickpeas, sausage and wheat. Pour 1 cup of boiling water over the wheat berries and let them soak for 3 hours. Drain the wheat and add to a soup pot with the pancetta, fennel, carrot and salt. Add 6 cups of water. Bring to a boil, then lower heat and simmer 30 minutes. Add the morcilla, chickpeas, potatoes and green beans. Simmer 30 minutes more. Place the bread in a bowl and sprinkle it with the vinegar. Let it set until vinegar is absorbed. 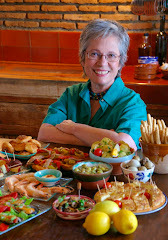 Place the bread in a blender with the garlic and pimentón. Ladle in enough of the liquid from the soup pot to soften the bread. Blend until smooth. Stir the mixture from the blender into the soup and cook another 15 minutes. 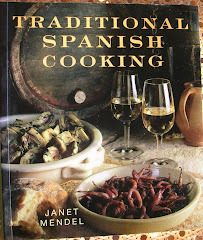 Remove the piece of pancetta and the morcilla from the soup. Use kitchen scissors to cut them into pieces. Return to the soup. Allow the soup to settle for 10 minutes before serving. Garnish with chopped fennel leaves. This vegan version of fennel soup is suitable for Lent, which is right now. It has olive oil instead of pork fat to give it substance. I used cultivated fennel bulb for this soup. Cut it lengthwise in quarters, cut out the stem and slice it crosswise. 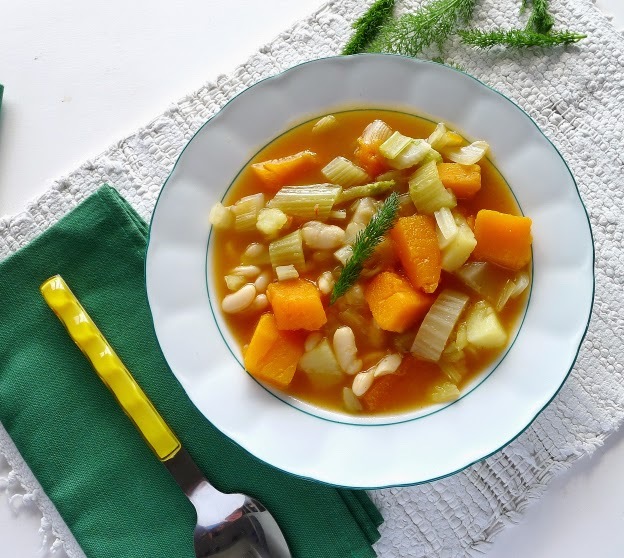 Canned beans make this soup easy to cook in a short time. If starting with uncooked beans, soak them 12 hours, drain and add to the soup at the very beginning of cooking.They need about one hour to become tender. The soup is thickened by a mash of cooked tomatoes, onions, pepper, squash, potatoes and garlic. The garlic is typically char-roasted before being added to the soup pot. To char-roast a whole head of garlic, spear it on a fork or hold it with tongs over a flame (on a gas stove) or place under the broiler, turning until it is blackened on all sides. When cool enough to handle, rub off outer blackened layer. Cut the top off the head of garlic and add the whole bulb to the soup pot. After cooking, separate and peel two, three or more of the cloves and add them to the blender mash. Fennel, pumpkin and beans for a Lenten soup. 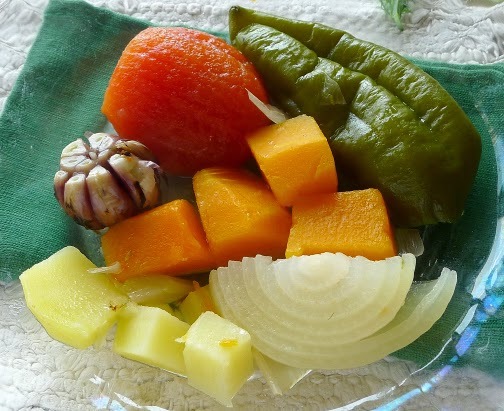 Put the fennel in a soup pot with the tomato, onion, pepper, garlic, squash, potatoes, salt and 1 tablespoon of oil. Add the water, bring to a boil, lower heat to a simmer and cook until vegetables are tender, about 30 minutes. Skim out the tomato, onion, pepper, garlic, a few chunks of squash and potato. When they are cool enough to handle, slip the skins off the tomato and pepper and some of the cloves of garlic. 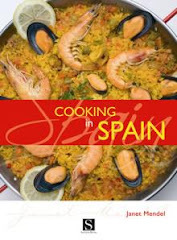 Place them in a blender with the cumin, pimentón, cloves and remaining 2 tablespoons of oil. Add enough liquid from the soup to make a smooth puree. Stir it into the soup. Add the beans. Cook 10 minutes more. Serve the soup sprinkled with chopped fennel leaves.